The Imperial Hotel & Suites in Niagara Falls Canada is located in the heart of the tourist district at the top of Clifton Hill. This 10 floor, 104 suite hotel offers wonderful guest room amenities along with convenient location to all the entertainment in Niagara Falls. Some include, games room, indoor pool and whirlpool, & free wireless internet. Nearby attractions include Casino Niagara, Ripley’s Believe It or Not! 4D Theatre, Ripley’s Believe It or Not! Museum, Maid of the Mist, Skylon Tower, and the Horseshoe Falls. 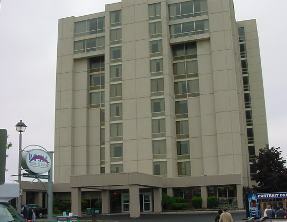 Great accommodations can be found at this all suites hotel in Niagara Falls, Ontario. Located in the heart of the tourist district at the top of Clifton Hill is the 10 floor, 104 suites Imperial Hotel & Suites. This Niagara Falls Hotel is ideally situated within walking distance to all the amazing attractions and superb dining located in the heart of Niagara’s Tourist District! Guests of the Imperial Hotel & Suites can easily journey to the Horseshoe Falls from this hotel and experience all the excitement available on Clifton Hill, as well as along the Niagara Parkways. Also located in the are of this hotel are some of the best dining options including the in-house dining of The Love Boat and The Golden Griddle. The Imperial Hotel & Suites offers 4 different spacious suites for all guests of the hotel. Somking and Non-Smoking rooms are available, and free wireless internet is provided throughout the hotel.